I have completely neglected blogging lately, mostly due to the fact that none of our projects are complete yet. Wow, what a roller coaster ride! It's amazing how each colour decision affects the next. Yuk! the yellow isn't working and the blue is looking too grey. Ok, so we have our blue! 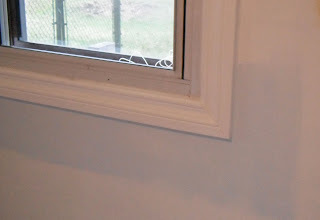 Above just shows one coat of Wave Crest around the window. Of course, every trip to HD & each decorating show we watch the decor plan gets "tweaked", we had a brief lapse while at HD and were going to use a brick wallpaper behind the gas stove in the LR so we had multiple samples of wallpaper hanging up behind the stove ... can you say "head spinning!" 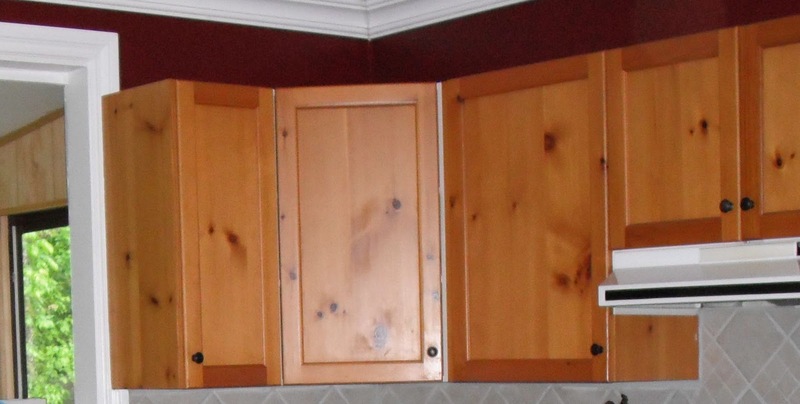 This is just one coat and we are still considering some aging toner around the edges, of course the doors look much better when the knobs are on too. Oh I feel your pain... remember that you are only looking at what you are doing right now. When you get your accessories in there it will begin to feel more like home. I always put my room together first so I can have a visual of the room done. I am so bad for changing things, then I have a dozen more holes to cover so I get that job out of the way first. I have been known to put things back up within hours of painting... shhh. I like the blues, it is so calming. I had to chuckle at your hubby watching HGTV and you are the one picking it up on the way home, doesn't it usually work the opposite way...lol. 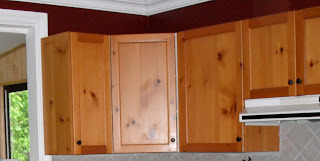 I like the idea of antiquing the cupboard edges too that will really warm things. Good luck, can't wait to see the outcome. Frank works at a Golf Course so he's off for the winter, he's at home today slaving away at the kitchen cabinets. He is a great painter! I'm the type that needs to tape and cover everything in sight, he doesn't need any tape at all. I'm very lucky! Swiss Coffee is my favorite white. It is just soft enough without being a color other than white. 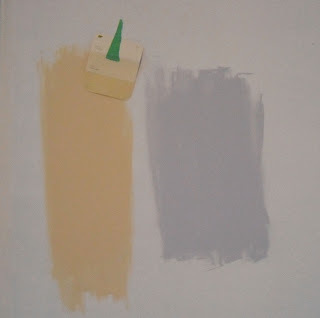 It looks like your kitchen walls are a very saturated color and I can't wait to see a better picture. Continued luck with the make-over. Hi Joanne. First let me just say what a dramatic transformation it was for the better painting those cabinets. Wow do they pop in all the right ways. I actually love the wall color you have around it. I am for the unique and bold which I think you have accomplished. Thanks for stopping by my blog. The seafoam color on my chandelier is on wood and the rest was metal. Thanks for asking. 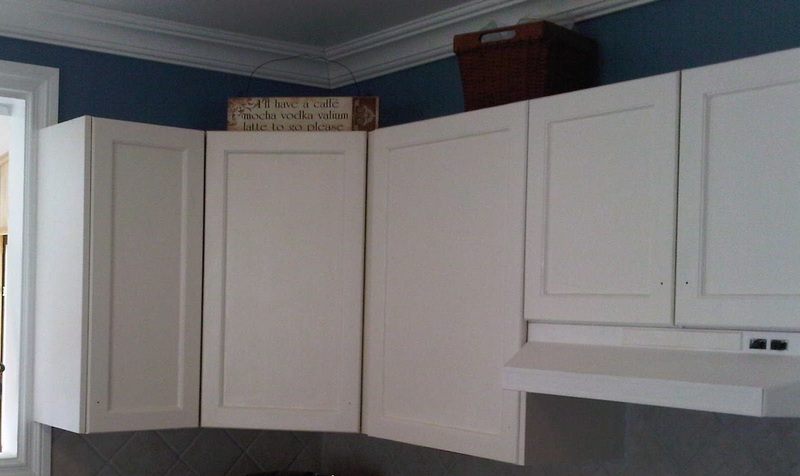 Love the cabinets painted, Joanne! Have fun aging them! Thanks for signing on as a follower on my blog. Nice to meet you! Hope you'll keep hanging around with me.